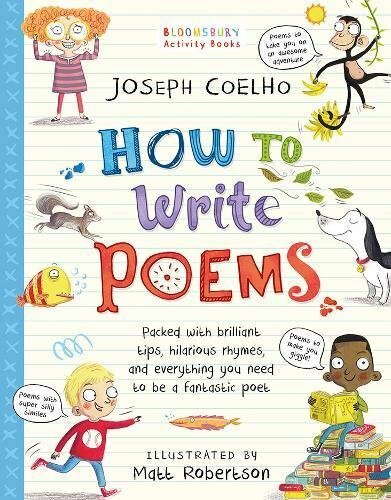 Written by prize-winning poet Joseph Coelho, and drawing on his experience of working with schools over 15 years, this is an activity book packed with ideas and information for aspiring young poets. It is designed to strip away the mystery of finding inspiration and writing poetry, and sets out to motivate children to have a go and find their inner poet. There are practical tips for building a poetry tool kit including creating word banks, playing with rhyme, using the five senses and ‘rainbow thinking’ or finding ways to describe colours. Easy to follow information on different poetic devices such as onomatopoeia, metaphor and alliteration is provided. There is an emphasis on a playful approach: put a tomato into the personification machine, what will pop out? Perhaps a ‘blushing’ tomato! Silly similes, included throughout, add to the fun. There is an introduction to different forms of poetry and how they are constructed including sonnet, haiku and mesostic (a variation of acrostic) with an invitation and guidance on how to have a go and lots of space to try things out within the activity book itself. Many inventive ways into creating poems are introduced, including ‘blackout poetry’ working from a discarded text, nonsense poetry, writing poems for special people or at special times of the year. Particularly lovely is the idea of creating a nature poem by writing words or ideas on leaves. Activity ideas are interspersed with historical facts and insights such as the longest poem, the trickiest tongue twister, the origin of the acronym RAP (rhythm and poetry in case you were wondering!). There is awareness - raising of poetry all around us for example in the names of paint colours such as ‘mole’s breath’ grey. Although mostly geared at the individual, fun with friends is also suggested with call and response playground games and how to set up different kinds of poetry clubs. This is a really useful and accessible book which is packed with ideas and information. It would be suitable for independent exploration at home or activities in the primary classroom.